High visibility is a must for traffic barricades. For this reason, the highly-visible color orange is an overwhelming favorite for construction zone barriers of every size, shape, and description. This attention-grabbing hue definitely earns a big vote of confidence from Roadway Construction Services (RCS). That’s why we place such importance on our orange traffic barricades rental. Orange traffic barricade rental is just one of the services typically associated with Roadway’s traffic management services. Let’s start with diversity. It’s no exaggeration to say that we cover all the bases when it comes to supplying construction zone barriers. Whether you’re dealing with a single lane closure or multiple lane closures, we have the barricades you need to ensure a safe, efficient work zone. 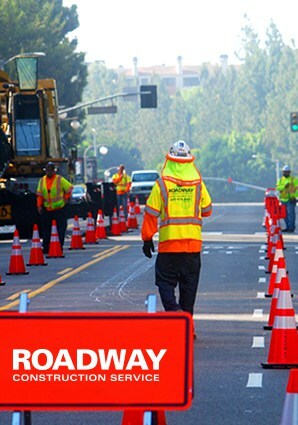 Our extensive offering includes cones, the ever-popular A-frame barriers, looper cones and tubes with reflective materials, sturdy speed bumps, crowd blockers, and the ruler of all traffic control barricades, K-rail. Who hasn’t seen K-rail hard at work on public highways? Without moving a muscle, these barriers prevent traffic from crossing into closed lanes, re-direct traffic, and protect pedestrians. And it performs these crucial functions all at the same time. Naturally, Roadway stocks both types of K-rail – concrete and water-filled. We also offer this barrier in a variety of sizes, guaranteeing the perfect fit for every project. OK, variety is a chief feature of Roadway orange traffic barricade rental. But what about being there when needed? Will you ever find us out to lunch, dinner, or a movie? Not a chance. Roadway is open and on call 24/7/365. That’s right. While you’re munching turkey legs this Thanksgiving, certain dedicated individuals will be hunkered down in our command center, ready to take calls and get the wheels of traffic control turning. You’ll never be helpless. Speaking of individuals, our orange traffic barricade rental is supported and serviced by the very best. This distinguished group includes our team of top-flight flaggers. Trained to perfection and credentialed with the highest certifications, these experts provide the information that traffic barricades can’t. How do they perform this feat? By employing a highly-efficient signaling language. Communicating these signals to passing motorists and pedestrians, flaggers keep people and vehicles moving in the right direction, at the right pace. Orange traffic barricades rental also has a behind-the-scenes dimension. Operating in this hidden realm is the acclaimed Roadway permitting team. Every permitting strategy these masterminds develop must include a suitable plan for the deployment of traffic barriers. In fact, getting an approval depends on it. To learn more about our orange traffic barricades rental, contact Roadway today. You’ll discover why we’re the go-to traffic management company in Los Angeles County, Orange County, Riverside County, San Bernardino County and all of Southern California.